Think Twice by Eve 6. They're not my favorite band in the world but I love that song. 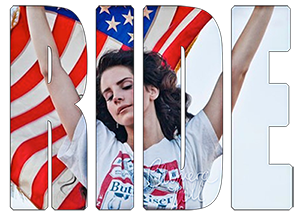 Anything by Lana Del Rey, particularly, "Off to the Races" and "Born to Die". I don't know why, but it suddenly just clicked. Just recently I've become obsessed with it and cannot stop listening. Quickly became a favorite. ^ Lotta people seem to like this song. I'll have to check it out.